Florida Gov. Rick Scott (R), one of the most vocal critics of President Barack Obama's health care reform law, won't carry out a central component of its aim to extend health insurance coverage to poor and middle-class residents of his state. Scott's administration will not create a so-called health insurance exchange under the law, the Miami Herald reported Friday, the deadline for states to notify the Obama administration whether they would manage state-run health insurance exchanges, work in partnership with the Department of Health and Human Services or turn over responsibility totally to the federal government. These health insurance exchanges will be the online gateways where as many as 30 million people will be able to obtain health coverage and access financial assistance starting in 2014 under Obamacare. Scott waited until almost the last minute to announce his decision, despite having been a vehement opponent of the health care reform since the debate started soon after Obama's inauguration in 2009. The former hospital industry executive founded an organization called Conservatives for Patients' Rights and sunk $5 million of his own money into a failed effort to derail the legislation that would come to be known as Obamacare. But after Obama's reelection last month, Scott attempted to strike a conciliatory tone on health care, writing Health and Human Services Secretary Kathleen Sebelius requesting a meeting and telling the Associated Press, "If I can get to yes, I want to get to yes." In the end, Scott got back to where he began: No. The Miami Herald reported that his administration blamed a lack of information from the federal government for the decision. Scott's decision comes with the backing of Republicans in the Florida legislature. The Florida Senate went as far as launching an anti-Obamacare website Thursday. Also on Friday, Utah Gov. Gary Herbert (R) indicated he opposes allowing the federal government to operate an exchange in his state and intends to work with the Obama administration to get Utah's existing health insurance exchange approved under Obamacare. In a letter to Health and Human Services Secretary Kathleen Sebelius, Herberts asked that the federal government approve Utah's exchange, even though it currently only serves small business, not individuals, and doesn't enroll poor people in Medicaid, thus doesn't meet the requirements of the health care reform law. "I believe that if you consider the Utah version of an exchange in its entirety, you will see we can provide the services Utah needs," he wrote. Hours before a midnight deadline, 25 states are on track to default to federal control of the health insurance exchanges in their states, seven will work in partnership with federal authorities, while 18 states and the District of Columbia will operate state-run health insurance exchanges, according to the Henry J. Kaiser Family Foundation. Most states not building exchanges have Republican governors and most states that plan to take on the task are run by Democrats. The health care reform law permits the federal government to run health insurance exchanges in states that don't create their won. This fallback has potential pitfalls however, that could lead to headaches for people seeking health coverage if federal and state regulators are at odds. 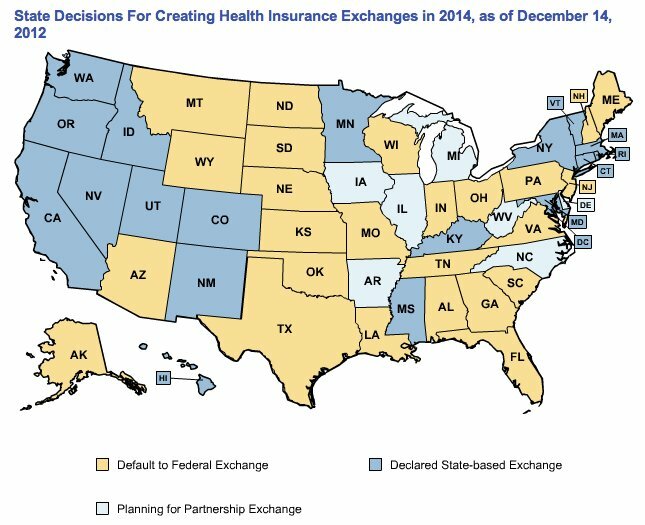 States with federal exchanges also forgo some authority, such as approving the insurance companies that are allowed to sell health plans on the exchanges in their states.